Of all the folk remedies for fighting a head cold, a hearty bowl of chicken soup has to be the hands-down winner. So pervasive is the belief in the healing power of chicken soup - aka “Jewish penicillin” - that scientists have actually taken it into the lab for testing. One such study, undertaken in 2000 by Dr Stephen Rennard (a pulmonary expert from Nebraska) concluded it was the anti-inflammatory properties of many of chicken soup's ingredients that helped ease the symptoms of a cold by reducing congestion. While such studies can't be considered conclusive, they do add weight to the claims of grandmothers across the centuries. Coconut oil: paleo superfood or health fad? At the very least for those suffering a chill, soups provide hydration and also contain nutritious ingredients that are well cooked and therefore easy to digest. Chicken soup, however, has an added benefit. Chicken protein provides an ample source of cysteine – an amino acid chemically similar to a drug known as acetylcysteine, which can clear mucus. A properly prepared pot of chicken stock will also contain gelatin extracted from the collagen in the chicken. The gelatin exudes a velvety texture and adds a rich flavour to the stock base. It's also a source of hydrophilic colloids; compounds that attract gastric juices and stimulate digestion. In traditional herbal medicine garlic was used to prevent and treat colds and flu, coughs and to expel parasites. The compound allicin is the major biologically active component of garlic and is largely responsible for its anti-microbial activity. It becomes active when the garlic is crushed or chewed and the compound allicin is exposed to the enzyme alliinase. For this reason, garlic is best consumed fresh, with minimal cooking. Finely chopping it or putting it through a garlic press will help realise its full spectrum of benefits. 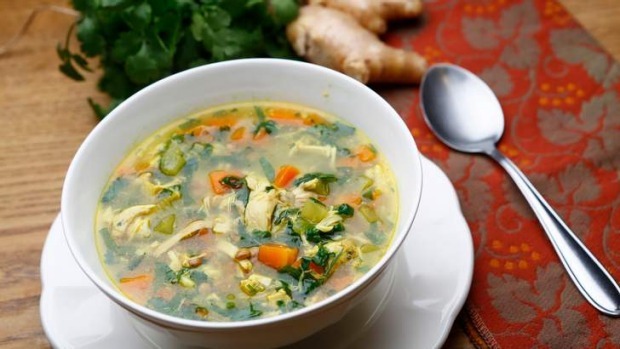 Ginger contains a number of immune-boosting properties that can add an extra kick to your pot of soup. Gingerol, which is found in fresh ginger, contains anti-inflammatory and anti-microbial properties that can dampen the symptoms associated with colds. Fresh ginger also has a unique diaphoretic capacity – meaning that it can create heat throughout the body and also induce sweating, which often provides relief after the onset of a cold. 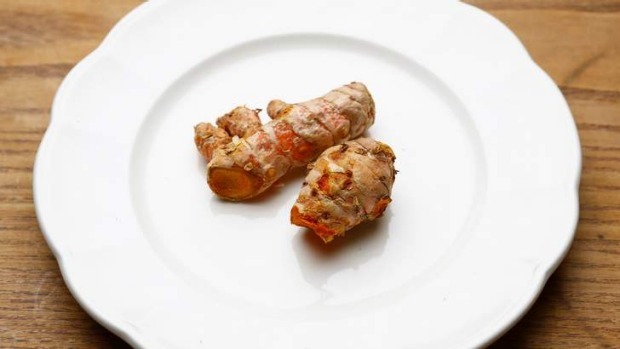 Turmeric is considered a general immune system booster due to its high antioxidant capacity. Recent research also suggests that it possesses strong anti-inflammatory properties that could help reduce symptoms associated with colds and flu. Tumeric also contains unique immune-stimulating polysaccharides, which can potentially aid the healing process in the body. Look for a free-range bird that is fairly small in size. Smaller birds contain more skin, bone and connective tissue, which will result in a richer broth with more flavour. A few extra chicken feet, some necks or even a few wingettes will also add to the richly gelatinous mouth feel. This soup is made with a base of chicken stock made from one whole chicken. As a short-cut you can buy ready made stock and use chicken breast or leftover roast chicken. However, using a whole chicken is more economical and also provides leftovers for the next meal. Prepare the stock by placing the whole chicken (plus any additional bits: feet, necks, wingettes etc) in a large stock pot, with the herbs, vegetables, onions and vinegar. Cover with cold water. Cook at a strong simmer, partially covered, for roughly 90 minutes. The chicken will be ready when the meat starts to separate easily from the bone. Remove the carrots and celery from the cooking pot and discard. Drain liquid from the meat and set aside (you can keep the onions and herbs in the stock). Separate the meat from the bone and set aside 2 cups of shredded chicken for your soup (any leftovers can be used in chicken sandwiches). Measure out your stock – you should have roughly two litres. If you have more, you can reduce the liquid. If you have less, just add additional water. Now you are ready to make your soup. Frugavore's tip: After removing the meat from the bones you can make another batch of stock by covering the bones with water, adding some thyme, celery, carrot and onion and simmering for a further two hours on the stove-top. Use this as a base for your next batch of soup.